Welcome to March’s underwhelming fossil fish of the month. For the blissfully ignorant amongst you, this series brings the worst and dullest fossil fish from the Grant Museum of Zoology’s collections for your viewing displeasure on a monthly basis. Natural history museums are full of this material, not every museum specimen can be the first, last, oldest, biggest or nicest smelling because life can’t always about the best. It’s important to take some time and some space to think about the mediocre. The run of the mill. The quotidian. The also ran. Sure, the sparkly stuff is what we put on display in museums but it’s really the middling masses that are key to understanding life. Not these fossil fish though. They’re ugly and useless. Or are they? Just in case there was any doubt with the question above, they’re useless. Here’s this month’s fossil fish, or what we have of it anyway. Image of LDUCZ-V1978 Macropoma mantelli from the Grant Museum of Zoology. This months fossil is what palaeontologists call “a bit of fossil fish”. Resembling an ugly oven mitt slightly buried in snow, according to the Grant Museum database this is a specimen of Macropoma mantelli from chalk beds in Lewes, East Sussex in the South East of England. This specimen was once part of the Earth Sciences collections at UCL and transferred over to the Museum. 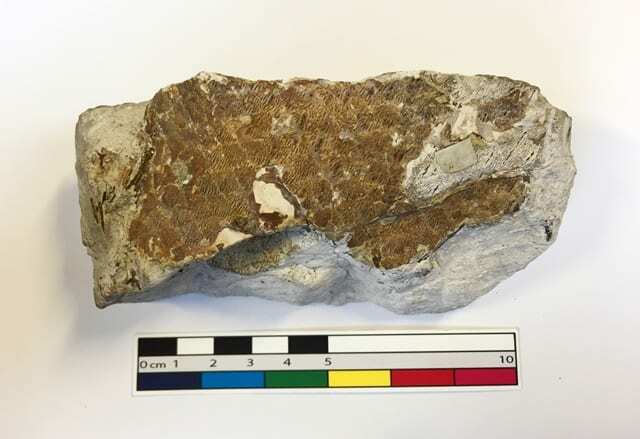 Macropoma mantelli is a species of fossil lobe-finned fish (known today by the famous lazarus species of Coelacanths) from the Cretaceous of the UK that reached lengths of up to 60cm long. This species has been described in some detail thanks to excellently preserved body fossils found in Brighton. Sadly, although what we have here shows some fine detail preservation it’s only a vertical slice through a fish. Looking closely at the scales, the distinctive worm-like tubercules running across the scales can be seen. These tubercules are typical for Macropoma. Scientific Research Thanks to the good preservation of many Macropoma fossils, analysis of the anatomy of Macropoma has suggested that it very closely resembles and is related to the living coelacanths Latimeria spp. Macropoma is one of the few genera of fossil coelacanths in which multiple species have been identified (Forey 1998). Even with this fact in favour of potential rich palaeontological study, Macropoma has been of little research interest. There’s been some quibbling about the taxonomy of this group by the usual historic fossil fish luminaries. Gideon Mantell first thought these were fossils of a relative of modern bowfin fish. The prolific Emperor God King of fossil fish and scientific racist Louis Agassiz then kindly redetermined them and named them Macropoma mantelli, after Gideon Mantell. Thomas Henry Huxley and Arthur Smith Woodward also took a look at these fish (or at least produced dry lists mentioning them) but then it’d be a difficult task to find a fossil fish these guys didn’t write about at the time. Macropoma is known well enough at least to appear in illustrated guides to fossils and ‘big book of dinosaurs’ type reference literature which is more than most of the fish we see here. In society According to the Jurassic Park Wiki, “Macropoma has never appeared or mentioned in any Jurassic Park films or books”. However it was one of the animals that could be created in the video game Jurassic Park III: Park Builder. Nothing says superstar status like a cameo in the spinoff video game of the worst Jurassic Park film to date. 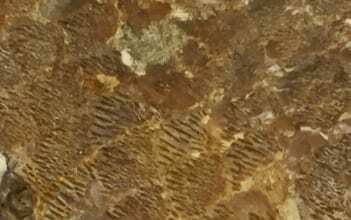 Almost as interesting to note, when viewed up close, this fossil of Macropoma mantelli looks like a desert camouflage pattern. Close up of LDUCZ-V1978 (left) and example of a Desert camouflage pattern used by the military and other people with something to hide (right). Forey, P L. 1998. History of the Coelacanth Fishes. Chapman & Hall, London. Mark Carnall is the Collections Manager (Life Collections) at the Oxford University Museum of Natural History and former Curator of the Grant Museum. This may be one of my favorite reconstructions in the series. Your up-and-coming palaeoartist so perfectly captures the essence of the dead fish. You could easily imagine it coming right off the page – and then I guess gradually falling to the sea bottom because it is, after all, dead, but you get the idea. I so agree, Copper. Evocative … poignant, with a modicum of tragedy that just breaks the heart. The reader’s heart, that is. Not the fishy’s. Because … y’know … it’s like … dead. It has ceased to be. It has expired and gone to meet its maker. It’s a stiff! Bereft of life, it rests in peace! Its metabolic processes are now history! It’s off the twig and kicked the bucket, it’s shuffled off it’s mortal coil, run down the curtain and joined the bleedin’ choir invisible!! This … is an EX-FISHY!